Congrats, Puddy – u leed! Conga puddy_tat an annipuss. Muthor an sun b heddin two da boootiq soon. 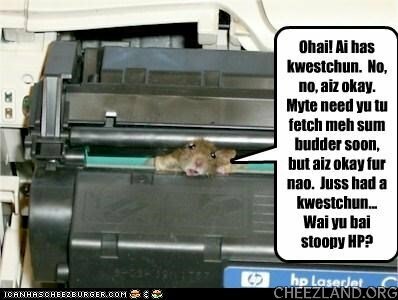 um… az wel az a kwestyun, Ai haz a stucc! Wowzer. Ai iz inn bigg trubble. Pleeze halp..
heers teh burfday fairy to say HAPPEE BURFDAY to CheshireKittehKat, Masquerade an evreewun else hoo haz a burfday today! i haz bringd yummy fudjy burfday caeks, cherry caeks wif wippy creem frosting, iskreem, sparkly party punch, fansee shiny party hats, an goodie bags filled wif never-miss jump ropes, mini majik 8-ballz, kandee, an sparkly smilie face stikkers! an a big swish ob teh burfday wand to making all yor burfday wishes come troo! an iz also teh birfingday ob Rhokit, hoo wented on ahed ob us to teh meddow. i haz bringed brite-colurd baloons an shiny marker pens to write messijes for hur or anywun else yoo wants to rembember an send to teh meddow.